Hey kids, teachers and parents! Did you like one of The Greenhouse Kids books? Who was your favourite character? What was your favourite part of a book? Email us what you liked and we will post it along with your first name, your age, and the city where you live. Remember, we will use your first name only! Send your comments to shelley@greenhousekids.com and we'll email you back! P.S. - Parents and teachers are allowed to email us too! My name is Nathan. I am writing this note to say thanks for the book. I liked how you named some of the characters after plants and flowers. It makes me excited to read it because I love nature. I wish you good luck in making your fourth book. My name is Erica and I am in grade 5.Thank you for coming to our school to talk about your book. I enjoyed reading your book. My favorite character is Snap Dragon. I was so happy when I got your book I started to read it right away and I finished in in three days. How many books do you think you will write? My name is Emily. I am writing to thank you for the fantastic books. Thank you for all the hard work on the books you write. I was so happy to read your book. Thank you so much! My name is Nathan. I'm writing to thank you for coming in. It was the highlight of the read-a-thon. How many more books are you planning on making in the series? My name is Alex. This is a thank you note for you. Also thank you for the free book and I enjoyed the book. I can't wait for your next one. They are so awesome and cool. What's your next one? My name is Balie and I love your book. I am on the first chapter and it is good so far. Thank you for the books. Are you going to write another book about Christmas or did you already make another one? Thank you for the book. "My name is Angel and I am writing to thank you for taking time to read and tell us about yourself and giving us a signed copy of your book Ghost Walk. To be honest, I don't read much mystery stories but I still enjoyed your book because it's interesting. Something about me is that I also love to read and write stories. I even wrote a movie script called Falling Down. I've been planning to get an agent and actually release the books and movies I write. I would like to be you someday. A question I have for you is who inspires you to write the stories you write? I also have a suggestion and that is to maybe make your characters a little more funnier like make them jumpy, you know what I'm saying. Please write back. Thank you for giving us a free book and to sneak peek of a little part of each Greenhouse Kids book. I enjoy reading your book. Are you making another book or not? How do you get your idea for the book? How many books did you made? My name is Ali. About your amazing books. I enjoy mystery books. Mystery books are my favorite books. I hope you make more books. My name is Simon. I am writing this letter to thank you for visiting. I am a very big fan of your books and the one I really want that is if your going to write any more books. What I want to say is that I am a mystery person. The last thing I want to say is you are a very cool author. Thank you so much for giving us the free Ghost Walk book. My name is Jack. Thank you very much for the book. I really liked how you put the kids names as plant names. My name is Makayla. Thank you for coming to our school and putting your autograph in the book you gave us. Are you going to make a book number 4? If you are it must be amazing. If you make more characters here are some suggestions (Rose, Lilly and Daisy). I can't wait to read Dig Deep. My name is Jadelyn. I want to say thanks for your having to take some of time to tell us about your wonderful book. Also I want to say for giving our own personal autograph. I also have a question to ask you. How many books are you going to write of The Greenhouse Kids. Are you going to make different stories? My name is Henry and I think your books is awesome and thank you for the free books. Are you going to write any more books? I love your book. I'm in grade 5 and 10 years old. I like mystery books and flowers. Maybe you could write an adventure story or a romantic story for grade 5 and up. Well thank you very much for giving me the wonderful gift. My name is Shelby and I am 10 years old. I'm writing because I like mystery books. Why do you make books? Thank you for giving us a free book. My name is Sterling.Just want to thank you for giving me a new book. I love surprises. Thank you for the big surprise. My name is Liana and I'm writing to thank you because you took all your valuable time to come and read to us. I also have 2 of your books, oh well now I do! First, when you came I thought "oh wait I have the first book". So after that huge surprise I have 2 books! Thank you, thank you, thank you!!! Well, nice talking to you. My name is Ryana and I thank you for giving me a free book and for coming to our school and reading to us for the read-a-thon. My name is Carter. Thank you for giving me a signed copy of your book. I like it a lot. HOw many books are in a series? And how many series are you going to make? My name is David. Thank you for giving me your book for free and I can't wait until you make your new book. Oh and thank you for your autograph. One day maybe you will make a new character called Roseabella. And I hope you think that is a good idea. My name is Jasmine. Thank you for the seak peek of your 4th book and an autograph inside my new book that you wrote. I really liked the book that you gave me. Maybe you can name a character after me because I'm also named after a white flower named The Jasmine Flower. My name is Aidan and I want to thank you for coming to read your book at the read-a-thon and giving me a free book and giving me a sneak peek of your 4th book. My name is Gabe. Thank you for coming to my school to speak about your fabulous "Greenhouse Kids" books. Thank you for giving me a Greenhouse Kids book personally autographed. It was fun getting to know some sneak peeks for your new book "Spy Camp". I really like your books. I hope you still write more Greenhouse Kids books! My name is Katrina. I want to thank you for coming to the read-a-thon and giving me a free book and giving me a sneak peek of your 4th book. My name is Audrey. I really enjoyed your story's sneak peek you have been working on. You should have a mean character named Steven that's not named after a flower or a plant. I can't wait to read your new book. Thank you for the book Ghost Walk. My name is Isabel. I am nine years old. I am very thankful for you taking the time to come to our school and giving me a signed copy of your book "Ghost Walk". The book was amazing. My name is Tam and I really enjoy the book you gave me, thank you. Every day I read 2 chapters. It's really fun, nice job! I love surprises and you gave me one free book it really fills my whole heart. You know how you wrote the note in the book you're printing was amazing. I am excited for the new book you're making. I have a question. I wonder are you going to write more books? How many are you making? Or are you just stopping? Thank you for the book! My name is Abbas. Just so you know I'm your biggest fan. Your books are so good. If you are coming back, could you bring us another book? That's all I have to say today. Have a good night. Bye. My name is Lea. I am writing to thank you for coming to our school as a guest reader and making that day extra special by reading some of your Greenhouse Kids books. Best day ever! I love your books. I have enjoyed writing to you. My name is Noah. Thank you for your amazing Greenhouse Kids book. It was spooktacular. I think that I like your book most at the page where the greenhouse kids find our Mrs. Yarrow is really ________________ . I can't wait to buy the third book in the series. My namei s Azieb. Thank you for showing us your wonderful books. I love to read, that's why I was so excited when you gave us those books for free. I love plants and I love books. You put that together for me, so thank you. Hello, my name is Tristan. I want to say thank you for the autographed books. It was an honor meeting you and it was so very kind of you to use your time to come to our school, give us free books and to talk about Greenhouse Kids. I was thinking that maybe you could include a new character named "Sunny Flower" in your new book "Spy Camp". I would like to thank you for signing my book. I love it so far. Also, I would like to ask if you could make a character that looks like me. My name is Catherine. I love reading your books. Thank you for the book that you signed to my class. I really really want another book of yours like "Ghost Walk", "Dan Delion's Secret" and "Dig Deep". I love reading your books because the "Ghost Walk" book was awesome. Can I be in the Greenhouse Kids book. I feel like being one of the characters in the book. I want to thank you for coming to our school on P.J. day. Thank you so much for coming. My name is Suzy. I want to thank you for taking your time to come to our school to read to us and for giving us a sneak peek of the book you're writing, called "Spy Camp". I also want to thank you because you told us we would have a surprise. I did not see it coming that we would all get our own new book called "Ghost Walk" or that you would be giving us a personal autograph. I also want to know if your new book called "Spy Camp" will have any new characters. I'm your biggest fan. My name is Bella. I want to thank you for coming to our school and for giving me a sneak peek of the book you are working on. I enjoy your book because I like mystery books. By the way I have a suggestion for your next book. You should make a character named Rosey Posey. My name is Jamieson Thank you for reading to me. Thank you for giving me a free book. I really enjoyed your book. I like gifts, surprises and new books. Are you going to think of another character. Are you going to stay on Greenhouse Kids or are you going to make anew book series. My name is Grant and I want to say thank you for coming to my school. I loved your book and I hope you make a lot more books. My friends love it too. I have a question, have you ever been in a greenhouse? Thanks again for coming in and giving my class books and talking about your book. My name is Parker and I am writing to thank you for the free autographed book, I love it. I think in your books there should be another kid named Lily Pad, that would be cool. My name is Corrine. Thank you so much for coming to our school and giving us one of your books autographed personally by you. How did you come up with great characters like Dan Delion and Holly Hocks? Are you going to be writing different types of books? Although I didn't get a chance to read "Ghost Walk" yet, I am going to read it soon. Those books were SO AWESOME I red all of them in three days. Once I started them I didn't want to stop. I liked it when I found out that Marry Yarrow wasn't Marigold and that Abigail Peedgid was really her that was so thrilling.Honestly after I got those books at Art in the Park I was ready to go home and start reading. I LOVED the books I was sad when I finished Dig Deep because there was no more Greenhouse Kids to read. I love the book The Greenhouse Kids. I am on my third chapter already. My favourite character is Johnny Jump-Ups. My favourite part is when Dan Delion goes hunting for bugs. 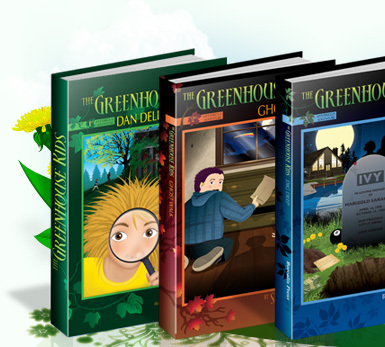 "Dan Delion's Secret, from The Greenhouse Kids series was AMAZING for me to read, I love the characters in the book. The illustration was good. My favourite character is Johnny Jump-Ups. I like him because he's funny. As soon as I got the book, I immediately started to read this book. " "I really liked "Dan Delion's Secret" from the "Greenhouse Kids" collection. I really liked the book because it had all sorts of fun-to-read characters. And the different chapters were so interesting and the pictures were amazing. I had so much fun reading and I can't wait to read more. " "I received "Dan Delion's Secret" from "The Greenhouse Kids" collection. I have been wanting to get one of "The Greenhouse Kids" collection. I love all the pretty pictures in the book. " 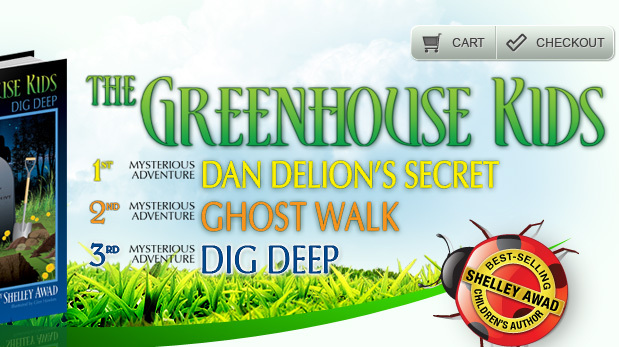 "I read the whole book, "Dan Delion's Secret" from "The Greenhouse Kids" series. It was great. I really like the book "Ghost Walk". I'm still reading it though. My favourite character is Foxy Gloves. I like her lemonade stand. My second favourite is Holly Hocks. I like her because she loves shopping and I love shopping too. My least favourite character is Speedy Seedy because he bullies everyone. I enjoyed reading the books. " "I really like "The Greenhouse Kids" book "Dan Delion's Secret". My favourite line is "You can pass a message by telephone, telegram and tell a creeper!" I am on Chapter 9. " Thank you for all your hard work making "The Greenhouse Kids" books and using your time to come to our school and give a really good speech. I love your books. I really love the books and I read it every day. I really enjoy it. I love your books. I hope you come back to my school. I love to read your books a lot. I read them all the time starting in grade 2. I really want to see the 4th book so much. Please make the 4th book fast. "Spy Camp" sounds really good. My son and I finished the first book last night. We really enjoyed the read and look forward to reading the two remaining books. I received some letters from kids at St. John Vianney and Central Public thanking me for our donation to your program. They were fun to read, and the letters alone make the donation to your program well worth it. Just a note to let you know that our thank you letters will be going in the mail tomorrow. Steve Krsul's Grade 3/4 class sent thank you notes to their sponsor, Lynn DeLaBarre and Siuchung John's Grade 4 class sent thank you notes to their sponsor, Ned Colovic. Both classes sent you a thank you letter. I would also like to express my thanks to you for taking the time to come to Dougall. It's wonderful to have an accomplished author from our community come in to share their own published work, as well as, to talk about experiences with the writing process. Hopefully we will can have you come back to Dougall next year! It was a pleasure having you visit St. John Vianney today. The students, teachers and I all enjoyed the characters introduced as well as brief excerpts from your series: We all learned a lot! The students will be busy writing their thank you notes over the next few school days. From there we will get them to the sponsors. Again, thank you for sharing your love of writing with our students. Perhaps there were some aspiring authors in the group, as their questions and interest certainly indicated that this may be the case. On behalf of our school community we would like to extend sincere thanks to you for being part of our Read-a-thon. It means so much that you have taken the time to partner with us as we seek to improve literacy and cultivate a love of reading in our students! Thank you for allowing Adam the opportunity to test the game. He was very excited to be apart of your newest endeavour. And another thank you for sparking the love of reading in Adam by visiting his school. He has read all of your books (including the lower level ones that he reads to his 6 year old sister). My older son always had a love of reading but Adam resisted until your books and clearly he is passing that love on to his younger sister as well. Best regards and cheers to new readers! Thank-you so much!! My son has thoroughly enjoyed both your book and the game. In fact, his class is doing a Science unit on Plants and Flowers and after he mentioned a few "unusual" plants like Virginia Creeper and Hollyhocks, his teacher asked him to bring in his book and make a little presentation. He was so proud! We are eager to read your 2nd and 3rd books now. David really loved playing the game. Even my 3-year-old loved looking for the hidden items. David only wished there were more plants and areas to unlock. Thanks again for the opportunity to try it out. I wanted to let you know that my grandson Ethan was telling me about your books & how much he enjoys reading The Greenhouse Kids. He is 8 years old. My son and I met you at Indigo in Tecumseh about a month ago. He purchased a couple of your books and I wanted to let you know that he really enjoyed them! The following letter was sent to Mitch Awad, one of the sponsors of the Readers Grow Into Leaders Literacy Program at LaSalle Public School. Thank you for buying Dan Delion's Secret. I like to read mystery books. Someday I would like to solve a mistery. I really like your book because it is very interesting and it makes me happy. I like it when you read us some of the book. I'm happy that we got an autograph from you. I've been reading your books and it's one of the best books I've ever read! I l-o-v-e love it! Thank you soooo much for coming to our school. I like it because it has adventure and mystery. Thank you for coming to our school. Your books are the best! I was looking for books that I was interested in, but your books, I am soooo interested in them. I loved the cake. I really, really, really want to read the second book! I am so interest in mysteries too. I love the book Dan Delion's Secret. Thanks for going to our school and sharing your book. Thanks for buying this book. I really liked this book because it is very interesting and it makes me happy. Your wife came in our school and told us about the first and second book. It is great. Can't wait to read it again. Thank you for coming to our school. Your books are awesome. I am on Chapter 16 in 2 days. I like your book. It is really good. I also like all the chapters, but I'm on chapter 11, but I'm sure the chapters I haven't read will be really good. I love the book that you made. It is like the best book I ever had. It has a lot of adventures in the story and my favourite part was that when Holley was playing dress up with her dog. Thank you for reading Dan Delion's Secret to my class. I started ready the book the same day and I'm already on chapter 8. I'm going to buy Ghost Walk. Again, that you for the book! Thank you for the book. I love the book. I am on chapter 4. I can't wait for the third book to come out! PS. Are you going to make more books? I like your books so much and I like how you named the characters after flowers. I also like how you make them look like the flower they are. You made a mystery book. Good thing mystery books are my favourite kind of book. I did not know that you were going to make mystery books and I really did not know that you were going to be the author at the school's amazing library. PS. I loved the book. Thank you for the book. I love it! I am on chapter three so far. I can't wait for the third book to come out! Are there going to be movies? I appreciate you donating your books. I didn't get a chance to read your book but it must be very good. I'm new to L.P.S and I love it here. Plus when I get one of your books, I'm sure going to get into it. Your books must be amazing. I can't wait to read one. Some of my friends love your books. They can't take their eyes off them. I loved your book. I read it about 3 times. You really inspired me. Me and my friend Avery want to write a book. When I was at my old school, you came and did another visit. Thank you Shelley Awad. Give a big thanks to all of the people who donated all the books. Thank you. PS. Me and Avery started the book. It is called The Adventure of Cokey Puppy. Thanks for everything. I loved everything about my new book. As soon as I got home, my sister (that is in grade 5) stole the book, jumped on my couch, and read. After half an hour, I looked and she was on page 100! She loves your books too! Me and Rudy really want to write a book and give a new free copy to you. I read your book one time already and I want to read it again! PS. Me and Ruby already got the book started. It's called The Adventures of Cooky Puppy. Thanks for everything. I loved every thing about my new book. As soon as I got home my sister (that's in Gr. 6) stole the book, jumped on my couch and read. After a half an hour I looked and she was on page 100! She loves your books too! Me an Ruby really want to write a book and give a free copy to you! I read your book one time already and I want to read it again. P.S. Me and Ruby already got the book started. It's called The Adventures or Cooky Puppy. Thank you for the book. I liked the book because it's really good. I like your speech because it was inspiring. By the way loving the book!! Do you know why I love the book? I love the book because I love flowers and I like mysteries in the book and you have it all. Your chapter book is the best one I've read before! You inspire me so much I just wanted to tell you that. Tank you for coming and visiting our school that means a lot to me. I love the book, I hope you believe me. That was very nice of you to give a book to all of us. I am reading it and enjoying it. I'm on chapter 7. I liked how you make all the characters named like a flower. Thank you for the book! Thanks for the book. I am so excited to read it. I really liked that you read a little about the book. It is a cool idea to make flowers a character in a book. I like mysteries in books. I am ready to see the next book. I love books. Thank you for the book it is a great book! Thank you for coming in and talking about reading, it got me reading. I love the book it is so good. I just can't stop talking about it. Hi my name's Allissa. I love reading and I love your book. I'm also happy that you signed my book. Your cake was so good. At first me and my friends thought the cake was playdoh. Of course, it wasn't. Your book rocked! I really love mysteries. Great book. Thank you for the book that you gave us. I am so looking forward to it. I enjoyed the presentation that you did for us. I really like the chapter books, especially Scooby Doo books. The books are really really funny to read because they make you laugh. They are so so so so so cool to read to myself. I hope I get all of it done so I can start reading your book. I hope I can get reading it after Halloween night. I've been reading the book Dan Delion's Secret. Thank you for buying me the book. I'm definitely getting the second book because I liked adventure books. So far, you are my favourite author. We wisht o thank you for taking the time tio visit our school. We were happy to learn about your Greenhouse Kids series, and look forward to reading the next books in the collection. Will says that he is going to read Dan Delion's Secret right away, then get the next books in the series, and then read them all again! Many of us agree that editing is our least favourite part of writing, so we were surprised to learn that you edited your book eighty-five times! We learned from this that our own writing can always be improved. We were inspired by your niece's story. It shows that if we're willing to work hard enough, we can overcome any obstacle. After your visit, we had a few questions. When did you start writing? Do you think your writing inspired your niece to write? When we considred which genre your books are, we began to wonder what is your favourite genre? Thank you againf or presenting your wonderful books to our classes. You rock! I am writing to you because I am thanking you for the free book. Also for presenting all of your characters and about the story. By coming to our schooled and taking the time. I think your books are amazing! My favourite character is Johnny Jump-Ups because both him and me are hyper and funny. You should make a whole series. I hope your books become a Pulitzer Price Winner. I am just thanking you for taking the time present your book. Hello, thanks for giving me the free book and the book mark. I liked the cover. My favourite kind of book is a book with colour. My favourite part of the book was the part you read, I have no idea what part it was. My second favourite part of the book was when the Greenhouse Kids discovered there was someone living in the house. My favourite character is Johnny Jump-Ups. I brought the book to the hospital when I broke my elbow. When I was bored I read the whole book. I'm happy you came to visit our school. I think some of the pictures are funny. I am grateful for you giving us the free Dan Delion Secret book. I am also grateful for you to take the time to present at LaSalle Public School. I am so thankful for the cake and I am so so sorry that we didn't get to eat your good cake. I am also thankful for the visit because if you didn't present your book I woul not understand the book. I am grateful for the book mark and I use it all the time. My favourite character is Johnny Jump-Ups. That is why I am grateful for you giving us a free book! I enjoyed it because it is a mystery book. That is why I am grateful for the book! Thank you so much for coming to our school. I am so thankful that you gave us a free book. Also, you gave us a free bookmark that has the books cover on it. Their are so many things that I love about your book. Three things I love about the book are first all the characters have flower names. Second their are lots of expressions in the book. Third the character Dan has bright, bright yellow hair. Once again, thank you so much for giving as a book and also a bookmark. Again, thank you. Thank you for the book. It is a well written and photographed book. Thank you for the free book and I think it took a long time for plan management. I am really grateful for the free book. Thank you for the bookmark too. My favourite part was when Dan found the secret tunnel. Thank you again Mrs. Awad for the free book. I hope your books are successful and the bookmark is beautiful. The about the author is a good idea. Thank you for everything you gave me. Thank you for the nice book. When I read the book I never knew there were plants called Holly Hocks, Johnny Jump-Ups, Fox Gloves, and Virginia Creeper but of course I knew a Dan Delion. My favourite part of the book was when Dan Delion found the greehouse. That was my favourite part because he found out about Lucinda the Ladybug. That's why I'm thankful that you took the time to come to our school and give us your book. The Greenhouse Kids Dan Delion's Secret. Thank you again. P.S. I like the pictures. Hello, thanks for giving me the free book. I really liked it. Why did you spend money on me you don't even know me? Thank you, I was running out of books to read. Do you like Big Bang Theory? I do! I think it's the best show ever. I watch it all the time. If you haven't heard of it, the channel is A&E. Did you know that 11.11.11 only happens once every 100 years. You'd have to be old to be alive to see that twice. Thank you again for buying the book for me. Please write back. Thank you for sponsoring my book. You are a very grateful person. And what a generous man you are again. I'm touched that you brought me the book and I think you are awesome. Thank you again because i was running short on books to read and thank you for your random act of kindness. It really was a surprise gift. You are a really nice guy. Thanks a bunch for the free book. You are an awesome sponsor. You are the best person ever! !